We’ve all visited our fair share of terrible websites. You know, the ones where you end up closing out before even diving into the content, or get frustrated because you can’t find what you’re looking for. What are these specific red flags and how do you make sure these things aren’t happening on your site? 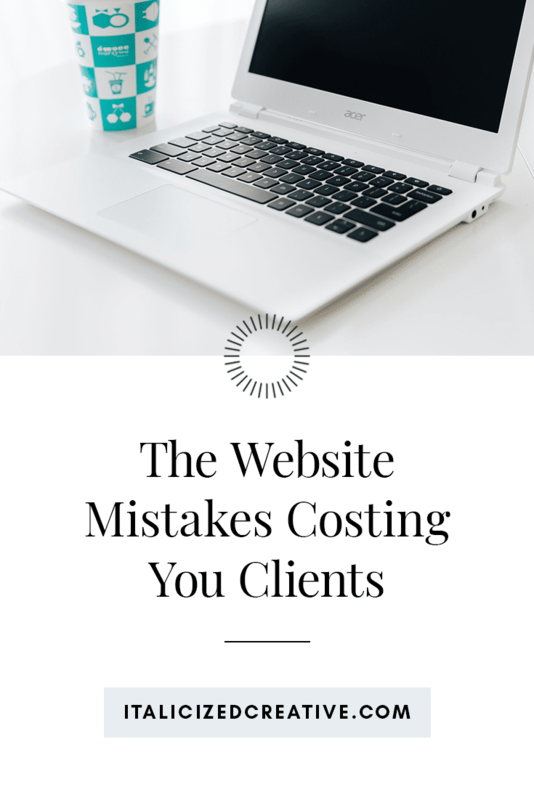 Watch the live video or read below to hear Kelly & I, the creators of the Bibbidi Bobbidi Bundle, cover these (all too common) website mistakes and how to avoid them on your website! As soon as someone lands on your site, they should immediately be able to tell what you do and who you serve. Don’t make them hunt to figure things out! It should be super obvious for site visitors to know what you offer and who can benefit from the site. And while you may think it’s super obvious, it may not be! You may know all the ins and outs of your business, but make sure the basics are covered right away to new-comers! Clear, cohesive visuals, direct messaging and concise content are key to translating successfully, right away. Try having the most important info above the fold, so site visitors immediately know what your site is about. They shouldn’t need to scroll to know they’re in the right place. And be consistent. Always keep your mission and goal of your site in mind. All content & visuals should reenforce your goals, and including anything that doesn’t will just muddy the waters and confuse site visitors. When someone lands on your site, where do you want them to go and how will they get there? What’s the main goal of your site? Is it easy to reach that goal from wherever someone lands? For example, if people are finding you through blog posts, can they easily find and access your available services? We have a tendency to complicate things. But when it comes to your website, one of your main priorities should be to keep things simple. Can visitors easily get in contact with you? If you want site visitors to reach out, be sure that your contact info readily accessible on every page of your site or make sure your contact page is visibly linked in your navigation. Delete anything that isn’t serving a purpose. This will keep things clear and make the important aspects stand out even more. In line with keeping things simple, your navigation should be clear, concise, and easy to use. Avoid fancy wording that may confuse your audience. I’m all for fun and fancy names for things, but be sure that your navigation is easily understood. Site visitors will get frustrated and close out if they can’t quickly find what they are looking for. Don’t overwhelm site visitors with way too many choices in your navigation. Use footer navigation for secondary pages or create landing pages, but be sure your main navigation covers the most important aspects of your site. When it comes to your menu, what pages do you actually need to include in your navigation? Think about your goals and what you want your website to achieve. Then base your navigation off of those goals. The great thing about your website is that things can always be changed and updated! Your site can always be improved, so be sure to watch how site visitors are interacting and using your site and adjust as needed. Try using a heat map software like Hotjar to gain insights on how users are behaving on your site so that you can adapt to get the best possible results. And remember to constantly reevaluate as your business goals change. While your site may have worked wonderfully for your past goals, as your business evolves your goals will too, which means you’ll have to update your site to help you reach them! Keep things speedy and avoid having a slow loading time. Size your images appropriately for web (without sacrificing image quality) and be mindful of how much content you’re placing on each page. More images = more loading time. Same goes with showing relating blog posts. Instead of loading the gallery of all posts ever, try having a few suggested posts featured so the page can load faster. Remember, 40% of web users will abandon a website that takes longer than 3 seconds to load. And be sure to only have (at most) one pop-up so you’re not continuously interrupting visitors browsing experience. Multiple pop-ups have users trained to think “spam” and will usually make a user untrusting or at least annoyed by your site. Don’t have loud music or video audio start playing when users land on your site. Give users a choice to play your content. Many people browse the web while listening to music, watching Netflix, or even at work. They don’t need your video or music blaring at them! Be sure to avoid crazy fonts, too small of a font size, text that is too light or other reading woes. White text on black text is not usually a good idea for large sections of content. Speaking of these large sections — break up your text! Site visitors won’t read long walls of text. Use headlines, or simply add an extra enter to give the reader breathing room (and increase the changes of them actually reading more of it!) Also, be sure to avoid tall sticky headers that hide half your page as users scroll. It’s hard enough to read content on a website, don’t restrict that space to even smaller. Is it clear where site visitors should go on your site? Are they prompted to interact somehow on each and every page? Be sure to direct their journey through your site by using intuitive calls-to-action that introduce the next action (i.e. buy now, learn more, etc.) Stay concise on link and button text — keep things short & simple. Also, be wary of adding too many calls to action. You don’t want to confuse visitors so it’s unclear what you actually want them to do on a page. Make sure it’s clear that these actions are interactive by adding hover effects and unique styling (color, weight, size, etc.) Make use of a heat mapping software to watch how these actions are converting and adjust as needed to get users where you want them to go. The internet is full of noise. Make sure your site stands out and is a memorable, positive experience for site visitors. Make an impression with clean, unique to your business visuals and graphics. Stop looking at what everybody else is doing and build a site that looks & feels like YOUR business. Copying what’s “trendy” or “popular” will only lead to frequent redesigns in the future to keep up with things. Keep in mind that your design should not distract a visitor from your content. Design is there to emphasize content, not take away from it! Ready to build a site that avoids all these Mistakes & showcases your business in it’s best light? BIBBIDI BOBBIDI BOO, WE GOT YOU. If you’re ready to lay your brand’s foundation and get serious on prepping for launch, let’s start on this first step together.